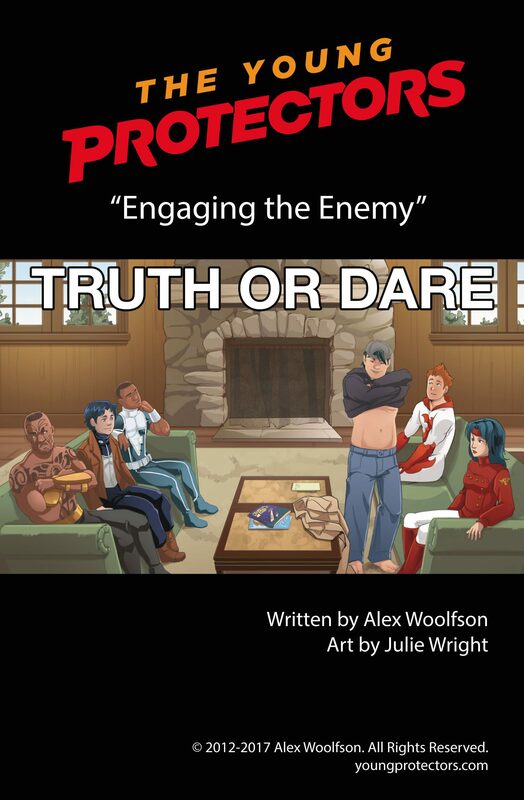 The events of this “Truth or Dare” bonus comic take place a month before the Prologue of the Engaging the Enemy arc and are set in a safe house that Spooky put together years ago. The Young Protectors have just arrived together at Spooky’s cabin, fresh from a mission that had taken a dark turn. Instead of engaging in their usual search and rescue efforts, The Young Protectors had done something very different. For the first time, Spooky Jones had requested his friends’ help to take down an insane and dangerous mage he’d been tracking. It was their first combat mission as a team and it went surprisingly well, except for one thing: as the mage fell into the Pits of Limbo, he was able to hit them all with the only deadly spell he knew – the Veritas Curse. But there was an upside to this particular spell: the Inquisitors didn’t want you to know what you had revealed. So as soon as you’ve complied with the terms, you forget everything that’s happened from the first light of dawn on the day the spell was cast. The rest of the team was not so sure. As they entered the cabin, Spooky continued to describe the history of the Curse and that it was designed to be flexible: all that was needed was a formal structure to make it clear that honest answers are expected, something with clear rules and punishments. It was Fluke who suggested a novel approach to the cure: that they ask their questions in a game of Truth or Dare. Spooky soon determined that they only needed to answer one difficult question each to be cured. And then, because they’d forget about everything that happened that day, Kyle wrote down a short note describing their win against the mage and why they all came to Spooky’s safe house. That way they wouldn’t be confused when it was over. Fluke then dared him to spend the rest of the game in just his underwear. Spooky took the dare and our comic begins.